Since the release of MilkyTracker v0.90.80 as open source, new software distributions have been adopting it at a steady pace. The long-awaited Ubuntu package is also out already, and has been for a while too! Yeah, we didn't know either for quite some time, due to a delay on the package search page we were monitoring. 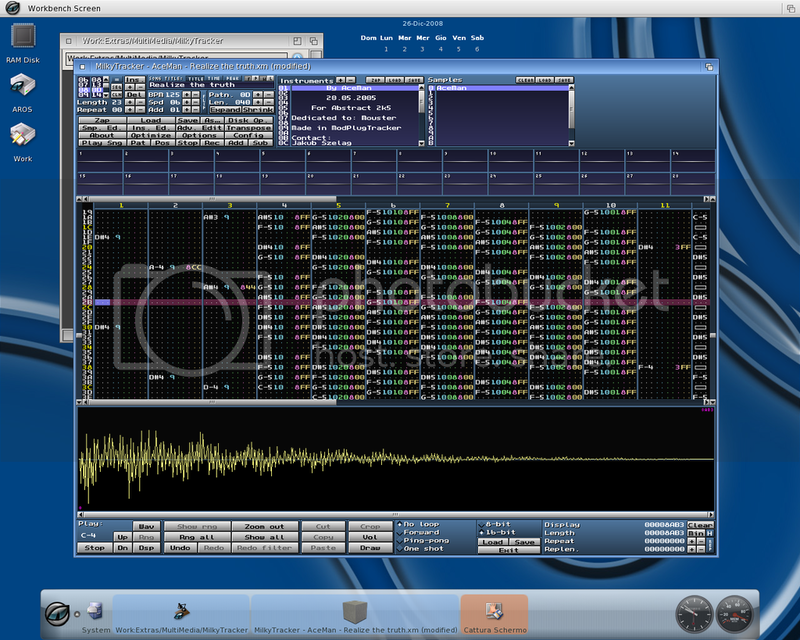 Other distributions that nowadays offer MilkyTracker include (but aren't necessarily limited to) Arch Linux, Debian, Enlisy, FreeBSD, Gentoo, NetBSD and SUSE. Let us know if there's more. Varthall's port for Amiga OS 4 was done in due time and we're awaiting to hear about more positive developments from the Amiga front. Also, by request, a G3 compatible OS X version was built. "I found a new use for my old white iBook: tracking! It's now called MilkyBook. :)", commented satisfied user azer4. Either that (linux should indeed be the faster option on a G3) or at least switch to 10.2. 10.1 was the slowest official version of Mac OS X.
Oh crap. Sorry, midnight. I'll get right on it..
Re: WIN CE 2.11 HPC Port? "Cannot find 'Milkey Tracker' (or one of it's components). Make sure the path and filename are correct and that all the required libraries are available. " Anyone wanna help with a port to 2.11 (or shed some light on it) ? Regarding which version of OS X to run on an old G3, I recommend OS X 10.3. It's actually the best performing. I'm running 10.3.9 on my Rev. A Bondi Blue iMac G3, and it actually runs very nicely. 10.2 is actually slower! Just thought I'd add my $0.02, even though this thread is quite old by now.